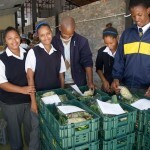 The food and climate change project was piloted on behalf of the City of Cape Town in a few high schools around the City. The main aim of the project was to raise awareness of linkages between food and climate change and how everybody can adapt to a more climate-friendly lifestyle by making simple, fun and healthy choices with regards to food consumption. change, including tips and advice on how to adapt to a climate-friendly diet and to save money at the same time. The toolkit includes an information booklet, a power point presentation, workshop activities and audit sheets that can be used at schools. The second phase was the initial testing of the toolkit through implementation at four schools. From the educational aspect the participants gained increased awareness of climate change, carbon foot printing and the relationship between food consumption and climate change. There was a strong emphasis on empowerment of the learners as the project activities encouraged problem-solving, critical reflection and conscious decision-making. Schools were invited to participate in a workshop where they received education about the relationship between food and climate change. Because all the schools could not attend a second workshop was held to give more schools the opportunity to participate. Based on the workshop and toolkits received, learners were requested to do an audit of their tuck shops and school environment. They were then encouraged to do a presentation of their findings, to the rest of their school, with recommendations on what could be improved. During this time the schools received support from their respective mentors who provided guidance and additional information. A second workshop was held on 12 March 2010 where the learners did a presentation about their findings at their schools and made recommendations. Various key role players, such as Western Cape Health Department, Western Cape Education Department and Pick ‘n Pay, attended this workshop. 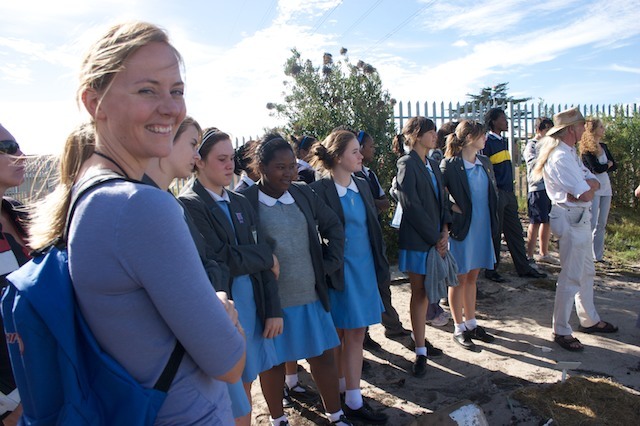 The schools were invited to attend an outing where they could learn more about the links between food and climate change on 16 March 2010. 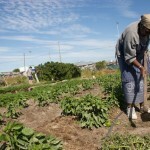 The first stop was Harvest of Hope, which is a community-based food garden initiative supported by Abalimi Bezekhaya. 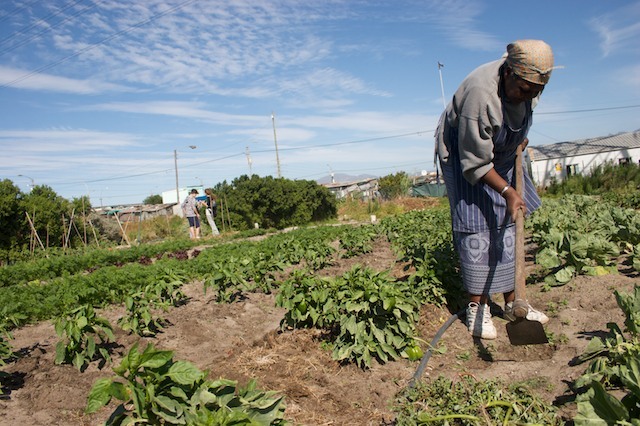 They first visited the Fezeka Garden in Gugulethu where they met with the ladies caring for the gardens, where after they went to the food distribution centre in Philippi. Here organic food is washed and packed for distribution to various collection points around the City. 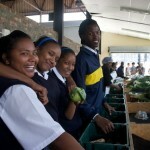 The group then went to Kwalapa for an organic lunch and to learn more about raw food and healthy eating. The afternoon included a visit to the Pick ‘n Pay regional distribution centre at Airport Industry where they could learn more about the cold food storage chain. The schools were requested to provide feedback about their participation in the programme and their experience about the practical use of the toolkit. 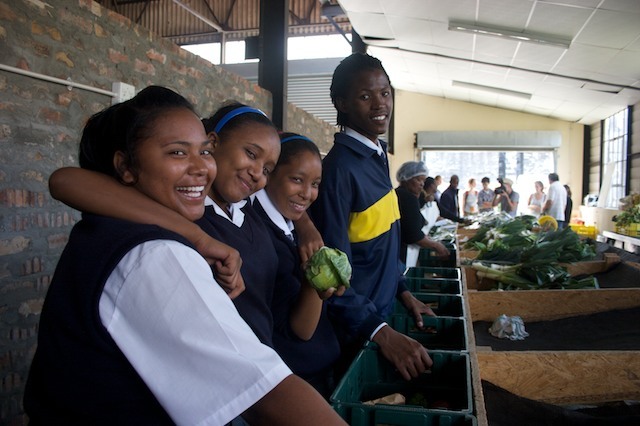 This information was used to update the toolkit so that it can be distributed to more schools in an attempt to promote a better awareness of the possible impact of climate change on food security, with practical guidance and examples for implementation.